When we spotted Alba Prat's breathtaking couture on Yatzer last week, we were immediately awestruck. A fashion student at the Berlin University of the Arts, Prat used laser-cut neoprene to conjure up images of the deep blue sea and underscore the impact of industrialization on aquatic life. Her "Synthetic Oceans" collection represents an underwater world in transition. Thousands of tons of plastic are carelessly dumped into our oceans every year, leaving a desecrated landscape where sea creatures barely cling onto survival. “Synthetic Oceans” comprises muted grays and contours that rise and fall like the waves of the ocean. With cool, muted grays like the sea on a cloudy day, along with contours that rise and fall like the waves of the ocean, Prat’s unconventional wetsuits are the visual seeds that carry her message to the observer. 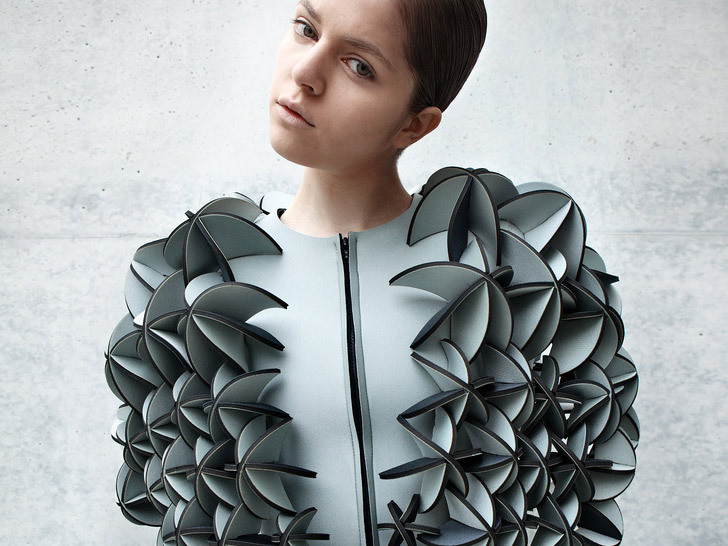 Although neoprene is a chemical-based textile, Prat chose it because of its insulating nature, particularly against frigid waters—her original inspiration. The work is an elegant intersection of fashion, fine art, product design, and social commentary. Prat's simple yet powerful forms serve as the backdrop for her potent point of view. Her color palette consists of cool, muted grays like the sea on a cloudy day. Combined with contours that rise and fall like the waves of the ocean, her designs are the visual seeds that carry her message to the observer. The diamond pattern adorning this black wetsuit resembles fish scales, a reference to the ocean life most affected by plastic pollution. The collection, Prat tells Yasmine Hottary from Yatzer, telegraphs the "cold and dark atmosphere where the beauty of the mutations and the defense mechanisms that its inhabitants embrace is to be seen."